The Surface Bolt is part of the Fulton and Bray range by ZOO Hardware. 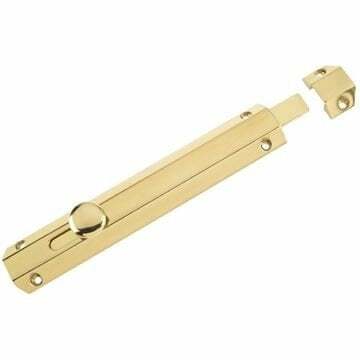 Designed and engineered to work on any door for additional security, or simply to hold the door in a closed position. Simply disengage the flush bolt to release and open the door. Supplied with a flat plate striker, angled striker for outward opening doors and a face fix keep (as pictured) with matching screws.Supplied with striker and necessary fixings. Supplied in a polished brass finish.